On the product, press the home button, if necessary. Select Network Settings and press the OK button. 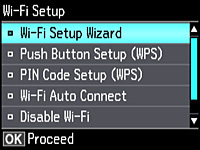 Select Wi-Fi Setup and press the OK button. Select Push Button Setup (WPS) and press the OK button. Follow the instructions on the LCD screen to complete WPS setup. Your product should now display a WiFi symbol on the LCD screen. If it does not, repeat these steps to try again.